Only few people know that the mountainous region, bordering with China and Laos in the north, is home to mystic tribes, with traditional bamboo villages, colorful markets and magnificent green rice-plateaus. This discovery tour includes a visit to this fascinating region, combined with the international standard accommodations and transports. Furthermore, you will take an unforgettable cruise to ‘the bay of the descending dragon’ (Halong Bay), visit the scenic limestone landscape of Tam Coc and wander the streets of imperial Hue and charming Hoi An. The white sandy beaches of Nha Trang and the bending waterways of the magnificent green Mekong Delta will make your stay in Vietnam complete. Vietnam Splendid Images Tour – Learn for the unique architect of Buddhism belief in One Pillar Pagoda, Tran Quoc pagoda – one of the oldest of the country and Quan Thanh Temple, make a cyclo tour through Hanoi’s Old Quarter and visit of Ngoc Son Temple and Hoan Kiem Lake. – Discover the colorful market of ethnic minorities in Sapa with picturesque market, explore black Hmong ethnic minority in Lao Chai village and Dzay people in Ta Van Village. – The Halong Bay on land, Hoa Lu is one of ancient capital of Ninh Binh, discover the spectacular sites such as: Hoa Lu, Trang An, Bai Dinh, Tam Coc – Bich Dong, visit 2 temples dating from the 11th century dedicated to kings Dinh & Le. – Halong Bay is a natural wonder with numerous islands and lime-stones, a ideal place to enjoy the sea, mixing yourself with the beauty of the nature, enjoy seafood on the board. – Visit the ancient capital of Hue – “the city of Peace and Poetry”, ride bicycle along the side of the Perfume River to discover surprising landscape, visit the Royal Tomb of Emperor Tu Duc, Royal Tomb of Emperor Minh Mang. – Explore antique artifacts of the former Cham Kingdom, visit Museum of Cham Sculpture in Danang, free time at your leisure at splendid beaches. – Visit Chuc Thanh pagoda – the oldest pagoda of Hoi An, Japanese Covered Bridge, Phung Hung House, market and ancient port, discover the life of the farmers in Tra Que Vegetable Village – famous for its aromatic herbs, mint and basil. – Take a small boat to a tropical island in Nha Trang Bay, free time at your leisure for swimming, snorkeling, relaxing from the boat. – Endowed with the fresh and romantic environment, Da Lat is considered a city of love in Vietnam, becoming a very attractive destination for honeymoon vacations, visit Cham of Pohklong Tours, Dalat city. – Discover the charm of the Mekong Delta visiting the floating market of Cai Be and taste fresh tropical fruits, explore hundreds of goods typically for tropical region, visit Cu Chi – immense network of underground galleries and narrow bowels. Upon arrival in Hanoi, you will be welcomed by our guide and transferred to your hotel. Hanoi is one of Asia’s most charming cities, with romantic boulevards and colonial houses. The rest of day is free for personal exploration. Welcome dinner at a local restaurant and overnight in hotel. Full day is spent on the visit to Hanoi – capital of Vietnam. In the morning, you will visit mausoleum of Ho Chi Minh President (close on Monday and Friday), and the One Pillar Pagoda, which is famous for the unique architect of Buddhism belief. Also the Temple of Literature “the first university in Vietnam”, founded in 1076, the Tran Quoc Pagoda, one of the oldest of the country and the Quan Thanh Temple, founded between 1010 – 1225 are on the program. In the afternoon, we visit the Museum of Ethnology (closed on Monday), featuring a wonderful collection of art and objects from throughout the country and different tribes. Then, we make a cyclo tour (1h) through Hanoi’s Old Quarter and visit of Ngoc Son temple and Hoan Kiem lake. In the evening you can enjoy a performance of the traditional Water Puppet show. In the evening, we catch train to Lao Cai. Overnight in air-conditioned wagon. Arrival in Lao Cai in the early morning, around 6:00 AM. Transfer to Bac Ha (100km – 3h on route). Breakfast in local restaurant. Then, we participate to Bac Ha’ market – a colorful market of ethnic minorities and open only in the morning’s Sunday. After lunch, we will visit Ban Pho 1 and Ban Pho 2 villages – dominated by multi-colored H’mong people and ancient castles of Meo King. Stroll by boat on the Coc Ly river. Overnight in Bac Ha. In the morning, continue to visit of Bac Ha. After lunch, departure to Sapa and arrival in late afternoon. Check in at the hotel. Free time to relax. Overnight in hotel. All day to explore Sapa with picturesque market, colonial house,… Visit of Muong Hoa valley, explore black Hmong ethnic minority in Lao Chai village and Dzay people in Tan Van village. R eturn to Hanoi by train. Overnight in air-conditioned wagon. Arrival in Hanoi in the early morning, about 5h30. Welcome and transfer to city for breakfast. No room for day use. Then, departure to Hoa Lu, 100km from Hanoi, one of ancient capital in Vietnam. The province is referred as ‘ the Halong Bay on land’. Visit of Tam Coc (three lagoons) with unforgettable stroll by boat during 2h. Continue to visit Bich Dong’ pagoda by bicycle. Lunch in a local restaurant . In the afternoon, we will visit 2 temples dating from the 11th century dedicated to kings Dinh and Le. Overnight in Ninh Binh. Departure to Halong Bay via Thai Binh and Nam Dinh. Arrival in Bai Chay around noon. We embark our traditional wooden junk to discover this spectacular site. Halong Bay is a natural wonder, with numerous islands and lime-stones rising from the emerald water. Fresh seafood lunches and dinners are prepared by our cooks and served on board. It is also an ideal opportunity to enjoy the sea, mixing yourself with the the beauty of the nature. Overnight on the junk. We visit the floating fishermen’s village and continue to visit Ha Long Bay with numerous islands. Around noon, about 11h30, return to the port where we disembark and drive back to Hanoi in the afternoon. In the course of road, we will visit the But Thap’ pagoda. In the evening, you can enjoy a performance of the traditional Water Puppet show. Overnight in Hanoi. In the morning, transfer to Hanoi airport for the flight to the ancient capital of Hue. Arrive in Hue, check in the hotel. In the afternoon, we will visit the Citadel and stroll by cyclo around the old quarter. Ovenight in Hue. In the morning, you will visit Hue, a surprising landscape. You can ride bicycle along the side of the Perfume River and stop at the famous Thien Mu Pagoda . We will visit the pagoda and catch a boat to visit the Royal Tomb of Emperor Ming Mang . In the afternoon, visit the Royal Tomb of Emperor Tu Duc founded between 1864-1867 by three thousands soldiers and workers. Then, visit Tu Hieu Pagoda. Overnight in hotel. In the morning we drive on one of the most beautiful roads in Vietnam, the Mandarin Road, to Hoi An. We pass the Hai Van Pass (Ocean Cloud Pass, a mountainous highway offering splendid views over the South China Sea. We visit the Museum of Cham Sculpture in Danang, exposing antique artifacts of the former Cham Kingdom, before arriving in Hoi An. Check in the hotel. Free time for personal exploration. Overnight in Hoi An. In Hoi An, we visit Japanese Covered Bridge, Chinese’s street, Phung Hung’s house, market and ancient port. Finally, we visit Chuc Thanh’s pagoda – the oldest pagoda of Hoi An (1454), built with Chinese bonze. Continue to visit Tra Que’ village by bicyle ( 5 km – 15 minutes from Hoi An). Tra Que is famous for its aromatic herbs, mint and basil. The sheets, which appear smaller than usually, are characterized with a particular flavor. You have chance to discover the life of the farmers while they are working strenuously with joys and enthusiasm . Lunch at local house. Return to Hoi An in the afternoon. Free time for visit of old towns in Hoi An. Overnight in Hoi An. Free time until the transfer to Danang Airport and flight to Nha Trang. Arrival, check in at the hotel. Free time to relax. Overnight at the hotel. After breakfast at the hotel, you take a small boat to a tropical island in Nha Trang Bay. Possibility for swimming, snorkeling from the boat. The rest of day is free for relaxation. Overnight in Nha Trang. In the morning, transfer to Da Lat. Da Lat was founded as a hill station to enable the colonials to escape the heat of Sai Gon. The city is located around a lake and surrounded by forests, waterfalls and rolling countryside. We visit Cham of Pokhlong Tours. Short visit to Da Lat city. Overnight at the hotel. In the morning, departure to Saigon, passing through numerous coffee and rubber trees plantations. Arrival in Ho Chi Minh city in the afternoon. During the city tour you will visit the Central Post Office, the Notre Dame Cathedral and the Ben Thanh’s market, passing the Saigon’s river, old streets, Ton Duc Thang and Nguyen Hue famous avenue. Overnight in Saigon. 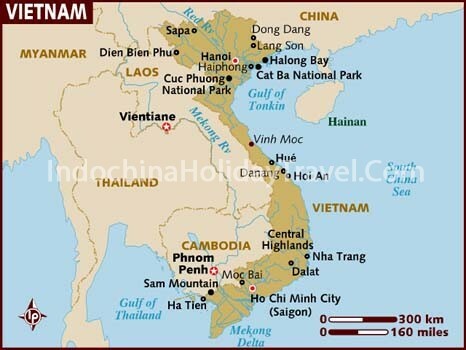 Departure from Ho Chi Minh to Tay Ninh – the Holy land of Cao Dai’ religion. Join in a prayer. Then, departure to Cu Chi, immense network of underground galleries and narrow bowels. Return to Saigon in the late afternoon. Overnight in Saigon. In the morning, departure to Cai Be (140km – 2.5 hours). Embark our private boat to visit the Mekong Delta and stop in Vinh Long. Discover the charm of the Mekong Delta visiting the floating market of Cai Be and taste fresh tropical fruits. Lunch at a local house with their specialty «Elephant ear fish». Then, continue to Can Tho on route. Arrival in late afternoon. Check in at the hotel and overnight in Can Tho. In the early morning, visit of floating market of Cai Rang, the biggest market floating in Mekong Delta exposing hundreds of goods typically for tropical region . By rowboat we explore the canals, by passing locals rowing up and down to the market. After the market, we visit the Binh Thuy temple and Khmer pagoda. In the afternoon you will be transferred back to Saigon. Overnight in hotel. Free time until your transfer to the airport for your flight home or next destination. Check out time: 12h00 .